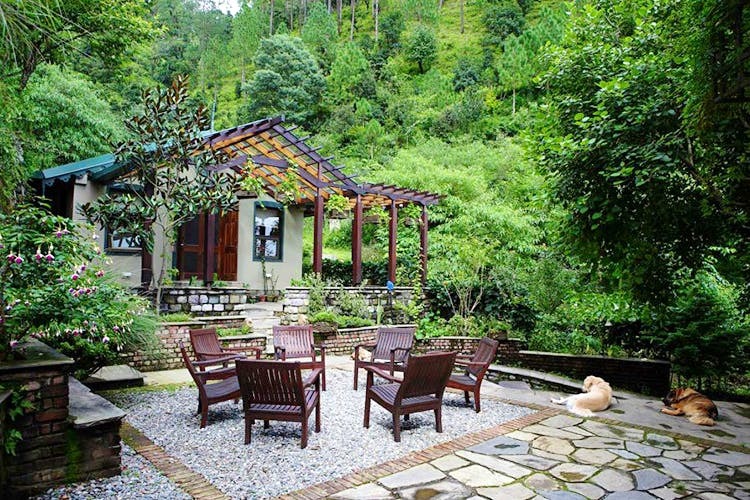 If a trip to the hills is on the cards, check out this vacation home just a few kilometres ahead of Nainital. It’s got huge windows that fill the rooms with sunshine, lush green gardens, a fireplace, and killer views. Dust storms, polluted air, and city commotion being hard on you? We say escape to this vacation home for your share of calm and, you know, breathing easy. Himalaica is a homestay about 11km ahead of Nainital (in the Kumaon Hills) that’s built by local craftsmen and looks like it’s right out of a postcard. The property has a main villa, a conservatory, a living room with a fireplace, a separate TV rooms, five bedrooms, and a guest cottage. Apart from the views, what will really catch your attention (and put your Instagram skills to the test) are the sitting decks and the lawns which are worked on by Shalini and Uttam (the owners), who keep adding new species of flora they find on their travels. You’ll also get home-cooked meals by Basant, the caretaker, who will make both veg and non-veg Indian dishes for you. The fridge is also well-stocked with frozen foods, so you midnight hunger pangs are catered to. And yes, you can get your own booze too! Feeling active? Go for a forest walk or trek, do some birdwatching, or meditate at a temple under an age-old Oak tree. Head over to Himalaica for a calm and serene retreat. If you’re looking for a combination of nature and modern comfort, this is it. Check out more details here. Book here.